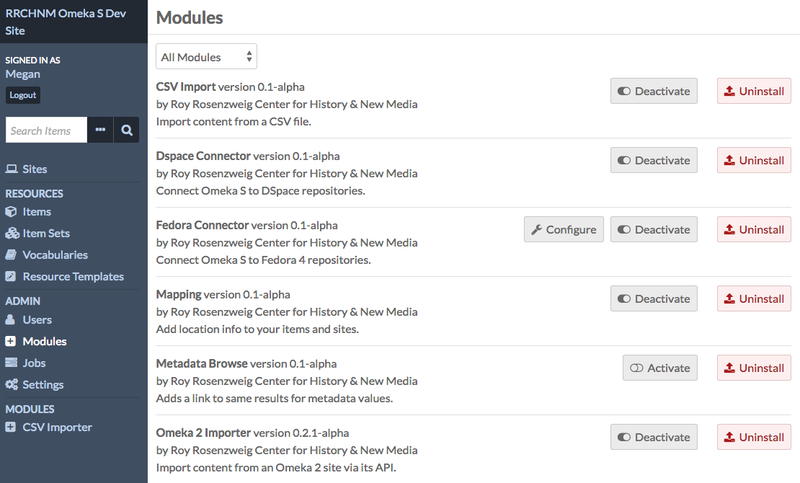 Modules extend the functionality of your Omeka S installation and sites. Note that only Global Administrators can install and manage modules. Site Administrators can browse installed modules. Other users do not have access to this tab. Any modules which have been installed on the Omeka S install should appear in the list of Modules. Each module displays the name of the module with the version number, creator, and a summary of its function. Configure (a wrench icon): some modules have settings which can be adjusted. Click this icon to adjust settings for the module in this row. Activate/Deactivate (sliding switch): when a module is active, the slider area background is transparent and the switch is to the left. When inactive, the background of the slider area background is opaque and the switch is to the right. Install/Uninstall (arrow and rectangle): use this button to install or uninstall a module. When the arrow is coming from the rectangle, the button will uninstall the module. When the arrow is pointing into the rectangle, the button will install the module. In order to appear in the Modules table on the Modules tab of the Admin Dashboard for your Omeka S installation, modules must be manually added to the modules folder of the installation, using an FTP program or an ssh connection. Download the zipped module to your computer. Open your FTP client, log on to the server that houses the Omeka S install and navigate to the /modules folder (this should be located in the main folder of the install). You can also use git to clone a module directly from the git repository. Do this only if you are comfortable with git. To install a module, navigate to the Modules tab on the left-hand navigation of the admin dashboard of your Omeka S installation. Find the module in the table and click the install button. Modules are automatically activated when installed. If you have a module which is installed but inactive, click the activate button to use the module. Some, but not all, modules include the option to configure settings for that module. If an active module displays the configure (wrench) button, you may configure that module. Information regarding configuration options for individual modules can be found on the documentation page for those modules. 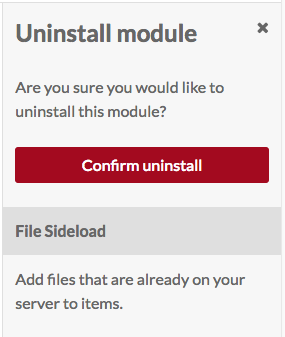 A drawer will open on the right side of the window asking you to confirm that you want to uninstall the module. Click “Confirm Uninstall” to continue. The uninstalled module will continue to appear on your Modules page unless the folder for the module is removed from the /modules folder on the Omeka S installation, which can be done via FTP or SSH. 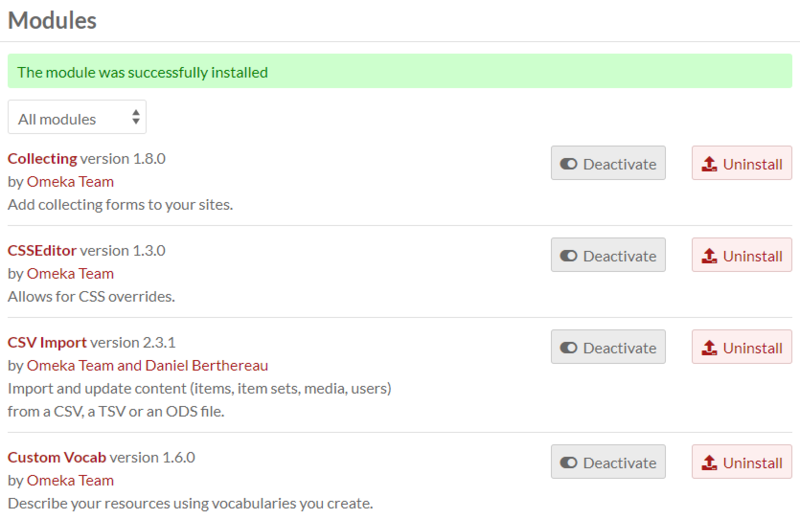 From the Modules tab on your Omeka S installation, deactivate the module you're going to update. From the Omeka S website or other source, download the latest release of zipped module to your computer. Open your FTP client and log on to the server that houses the Omeka S install. Navigate to the /modules folder (this should be located in the main folder of the install). Move the old copy of the module to your desktop (or somewhere else on your local machine where you will be able to find it). On the Omeka S installation dashboard, go to the Modules tab and activate the new version of the module. If you are concerned about problems with the update, be sure to keep the older version of the module on your local machine in case you have to switch them back. You would roll back in the same way you updated. If you run into problems while updating, turn on error logging and post on the Omeka Forum.